2.5 stars. I enjoyed the first two in this series but I burned out about halfway through this one. It felt like the author was burning out on the idea too. I may read the final entry, book 4, sometime in the distant future but probably not. For now, I need another vacation from all things zombie. Keith C Blackmore has exceeded my expectations with this 3rd installment of the Mountain Man series, excellent read and at the back of the book Keith mentions that he has a plot outlined for book 4 but only if enough interest is generated from readers.May I say, get on board and read this fantastic series and let Keith know that he has a hit here, I would love to know how Scott and Gus get back together and how that intertwines with Scott's new family.Please Mr Blackmore let us readers at the very least see the 4th book, if not more. Zombies plus cannibal gangs of Norsemen equals a fun, bloody post apoc tale. Still loving this series, on to book four! Great finale to the series. Well paced and emotionally charged along with the gore that one expects from the MM books. New characters join familiar faces in this showdown of good and evil. Fun and fast paced ride! Took me a while but I finally finished the 3rd Mountain Man book (I borrowed the book from another Goodreads poster and only got to the 81% mark (tried to read too many books at one time), and just this week another poster came thru for me). The book could have stood by itself as a stand-alone as it does not have much of a connection to the Mountain Man (Gus) except with the lead character (Scott) of this story being featured in the 1st Mountain Man book.I thought this was a very good zombie thriller. I enjoyed the new characters introduced in this story, the good and the bad. I liked the ending where Scott & Amy were going after Tenner as well as Fist (leader of the Norsemen). Remind me to never pi*s off Amy!In this story the zombies were not really the central factor to the story, oh they were there and still munching and chewing on the regular humans, but they were more of a side bar to the villainous killer Tenner (and what a freak he was) and the cannibalistic hoard called the Norsemen. What a group of sick puppies! So, even if you have not either of the first two Mountain Man books (where are pretty good as well), you can still enjoy this thriller. Great to see characters from the first book get addressed in this one. Keith Blackmore isn't writing literature, but it is clear from the beginning he isn't trying. He is spinning a yarn for us, and if you enjoy zombie books, you'll enjoy this one. The outcome of Scott's hunt for Tenner.A new and intimidating group of marauders.And a small band of survivors with a dream.This marks the last book in the series and it satisfies on all ends save one, which you'll have to read to find out.Nicely done again Mr. Blackmore. It took a while for this series to grow on me but I love the anti-hero Gus. This book and the first are the best so far. I loved seeing the story from Scott's POV. I really hope Scott and Gus reconnect later in the series. 3rd book in this series, it's a good one. Bloody and a little more action oriented and twisted than the others. If you're squeamish, I'm sure you'll love the Norsemen. Fair warning: There are a couple curse words in here, but don't worry, they don't detract from the story one bit. If you're into post apocalyptic zombie literature Keith Blackmore is one of the best authors out there. What a guilty pleasure! I'm going to write a review for the trilogy all at once, because I don't want to take the time to hunt and remember all three books. So, this is only for people, like me, who appreciate zombie apocalypse fiction. All others, ignore this.Both the author and the reader are wonderful. Entertaining and suspenseful. Characters came to life, from the two main characters in the first and last novel to the psycopathic killer and hells angel cannibalistic motorcycle gang. Blackmore scores in the little things. His first main character being an alcoholic, the prizing of toilet paper in an apocalypse, zombie babies (in his first story, Hospital, which is a prologue). Enjoyed immensely. I hate, hate, hate zombie books, so I would never have picked the first book in this series up, except that R.C. Bray narrates the audiobook versions of these books. And R.C. Bray would make the phone book worth listening to. While I likely would have given up after the first book in the series without R.C. Bray, with him, I'm willing to give it another chance (plus, I got an omnibus edition with the first three books, and I didn't have anything else waiting in the queue for listening). It's unlikely I will pick up the fourth book, but then again, there is R.C. Bray to listen to, so I'm not willing to say I won't pick it up at some point. Initially disappointed this didn’t follow Gus’ story from books one and two, and initially unsure about the Norsemen characters, this turned into a pitch-perfect cross-genre action adventure novel, tying the storylines within ingeniously and seamlessly. Nicely drawn characters and many imaginative visual images. Great book! Tough book to review. I dislike graphic violence and cruelty (that is just from the villains to emphasize how evil they are). However, the book is well written and I would have to say I enjoyed the book in the end. I liked the main character and supporting characters (the good characters that is). Really liked this third book. It lets us know what happens to the charters Scott and Tanner from the first book. You get introduced to a new group of survivors and the Mad Maxish group of the Norsemen. All in all fun and crazy read. For a zombie apoc fan, I am sure this would be a great book. For me, it was a bit much. No more zombies for a while. May eventually return for book 4, but I need a rest from the gore. Great trashy zombie fun, excellently narrated by R. C. Bray! I really enjoyed this book. When I started this series I had no idea that this story was based in Nova Scotia, Canada, so it was a nice surprise since I live in New Brunswick - just 20 minutes away from Nova Scotia. I was never bored while reading this book. I love all the characters, even the bad ones because they are very believable. Super boring, it took me 6 days to get through this one and that's a fairly long time for me. Some parts were okay, other times I wasn't even listening and didn't really mind not knowing what had happened.The zombies in these books are super inconsistent. Firstly the books never offer any explanation to how the zombies came to be in the first place--and how come there aren't any new zombies appearing? It's something that has affected the majority of the population so far, so why did it stop? Not a single new zombie is made in the books. Secondly, the zombies are sometimes described as absolutely mindless with no other purpose than feeding, yet at other times they are "grinning at" the people or "considering", even "thinking", which goes directly against the other times where they are described as having no thinking capabilities.This book finally has a female character though, so yay to that! Too bad she's extremely generic and boring, and only serves to direct the male protagonist's actions and thinking. Oh, and she's also sexualised hell of a lot. Not so yay after all.Two stars is me being generous, to be honest. The gory parts were fairly well written and some parts were relatively creepy, I just had a hard time taking it seriously when the rest of the book was so terrible. "Blankety blank rats, man, and I thought zombies creeped me out. 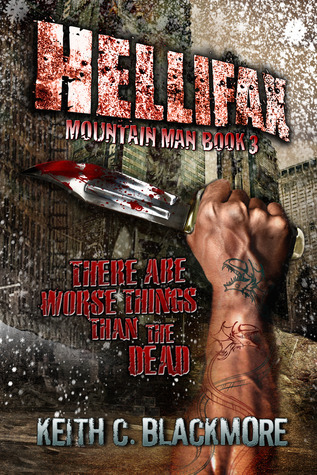 "This is the third book of the MOUNTAIN MAN series that I've read and they just get bloodier, guttier, and more gruesome. Just what a good zombie book is supposed to do.This book has Scott going to Halifax, the capital of Nova Scotia, on the trail of Tenner, the serial killer who thinks he's a god.Along the way he runs into Moes, zombie rats, maniacal rig pigs, and...other survivors of this terrible devastation that has hit the world.I missed the comic relief of Gus. 400+ pages of blood and guts with no let up did get a little tiring. But I did enjoy the new characters that were added.If you're just thinking of reading this series, you should start at the beginning.1/2. "The Hospital" - short story that starts out this crazy zombie fest (also included in "Cauldron Gristle")1. "Mountain Man"2. "Safari"3. "Hellifax"And since I waited for awhile to finish the series, book 4 "Well Fed" is out and I'll be reading it next. This really has been a humdinger of a series so far and I am really looking forward to see how it ends.Do be warned - if you haven't got the inkling so far - that there is blood, guts, gore, profanity and more in this series. Oh Keith...... Did you have to rush on book 3 or something? (Warning: spoilers)Well, although I still liked all 3 books, this one was slow and boring for the first half.I still gave it 4 stars because I loved the last quarter of the book. I hope book 4 has more originality. The use of the same phrases over and over from book 1 to 3 is irritating. I love the phrase "zombies looking for hugs" so that's ok to re-use from time to time, but to actually say "the zombie was the biggest he'd ever seen, must have been a basketball player before the outbreak" (paraphrasing),for the main male character in 2 different books, irritated me...another was "he held the pistol and flashlight like he'd seen in the movies" ...There were other phrases but those 2 irked me most. And enough hiding in a f*cking attic for 2 days to avoid moes... it's been done enough... the rats started to get boring too...and I MISSED GUS, AND HIS DRINKING AND BALL SCRATCHING!!!! !I hope Book 4 is more original, now that Gus is with new people...I also hope they don't make him stop drinking, swearing, and going on safari. After two books of the great Augustus Berry, and the third book having only his mention, there's no way this book could be as great as the ones that came before it. Still, it's a very good read. We pick up with Scott and Tenner, and we meet some new people, but nobody in this book is fleshed out and is as interesting as Gus, and that is where I am biased when it comes to judging this book.It's a little longer than it needed to be and some scenes are dragged out for too long. Few times I found myself bored (I didn't with the other books). It needed more editing than the previous books, a lot of typos and mistakes, but doesn't really detract from the reading.The ending is great, however, and made me miss Gus all the more.Still, this Keith guy can write and I will read more of his work in the future. I find it hard to believe he'll ever top the first two books in this series, though. We find out what the secondary menace in the apocalypse is. I always thought the cockroach would be the critter to survive everything, oh well. An interesting twist in the story, but didn't add much to the plot and didn't last too long. Our hero Scott is on his way to Hellifax to hunt down the killer of his friends from book one. The serial killer Tenner has been enjoying the lawless apocalypse and keeping quite busy. Scott is on his trail. A third party makes their appearance; "Fist" and his gang of ne'er do wells add their cannibal ways to the mix. Add the rampaging zombies and it's getting a little crowded in here. Makes for a lot of action though; gruesome action, very gruesome. Good story, good ending to the series. Or is it? Gus is still out there somewhere. Room for book four to tie up loose ends?